187 leaves. 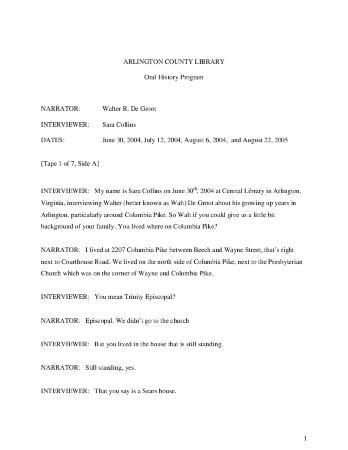 ;Interviews conducted on June 30, July 12, August 6, and August 22, 2004.;Includes information and discussion of the Columbia Pike neighborhood. One of the interviews was conducted during a walking tour of Columbia Pike in Arlington County. ;This is a transcript of an oral history interview on audio cassette tape. The opinions expressed in this interview are those of the interview participants only. They do not represent the views of the Arlington Public Library or its staff. All literary rights to this transcript, including the right to publish, are reserved to Arlington Public Library, Arlington, Virginia. Excerpts up to 1,000 words from this interview may be quoted for publication without seeking permission as long as the use is non-commercial and properly cited. See conditions of use clause below. Online content in the Center for Local History's Community Archives may be printed or downloaded by individuals, school, or libraries for personal use, study, research, or classroom teaching under certain conditions of use. Unauthorized use of images is prohibited.